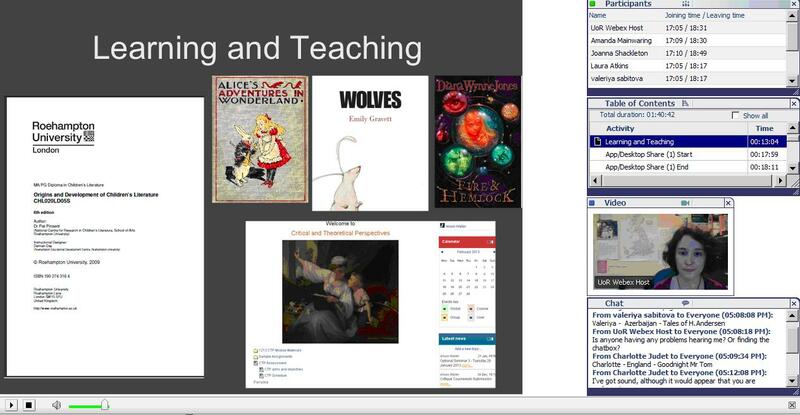 Our third Virtual Open Day for the MA in Children’s Literature by distance learning was held last Thursday. Individuals from the UK to Azerbaijan joined Laura Atkins and I for a fun event to learn more about the programme and the NCRCL. We introduced everyone to the team and demonstrated the different teaching methods and tools on the MA. Laura spoke about some of the methods available, including ‘British Children’s Literature 1900-1960’, ‘Visual Texts’ and the new creative ‘Writing for a Child Audience’ module. Before you start watching, go to the top Menu and click on ‘View’ – make sure that ‘Chat’, ‘Video’, ‘Participants’, and ‘Playback Tools’ are all ticked. Many thanks to all those who took part – and look out for more events in the future!